A tour of not-to-be-missed public places—parks, plazas, memorials, streets—that shape the New York experience. The thirty-eight urban gems covered here range from newly created linear spaces along the water’s edge, such as Brooklyn Bridge Park and the East River Waterfront Esplanade, to revitalized squares and circles, such as those at Gansevoort Plaza in the Meatpacking District and Columbus Circle, to repurposed open spaces like the freight tracks, now the High Line, and Concrete Plant Park in the Bronx. Readers can discover midtown atriums, mingle with the crowds in Union Square, travel offshore to nearby Governors Island, and enjoy the vistas of historic Green-Wood Cemetery. Pete Hamill writes in his foreword, “I’ve . . . made a list of new places I must visit while there is time. With any luck at all, I’ll see all of them. 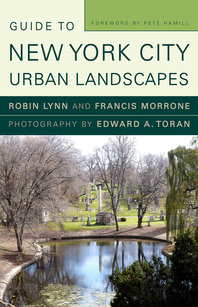 I hope you, the reader, can find the time too.” Concise descriptions, helpful maps, and vivid photographs capture the New York urban scene.